Buddy was surrendered to PAWS in April 2011 by his previous owner after she moved to a retirement home and was only allowed to keep two cats (she kept the two siblings). We adopted him on June 15, 2011 from PAWS Cat City in Seattle. Buddy was on the smaller side for a male cat. He weighed about 10 pounds. His coat was a mixture of browns and whites, mostly brown on top with a white tummy and feet. He had medium length fur and green eyes. Buddy's exact age is uncertain, but his adoption paperwork indicates he was about 12 years old when we took him home. 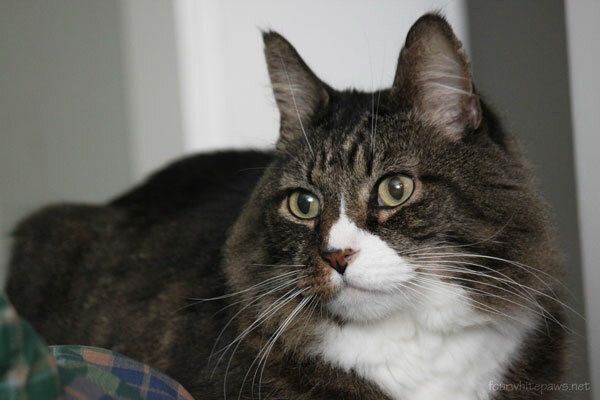 His previous owner described him as "Talkative, Friendly, Submissive and Affectionate." In the short time he has been with us he has shown us his talkative, friendly and affectionate side, but not the submissive side. He has no problem standing up to the other cats for what he wants or even telling them his mind. His meow sounded more like a grumpy grump than a friendly greeting. Buddy died on Monday, August 22, 2016 from complications of congestive heart failure. He was not big into treats. He loveed to snuggle and be held. When snuggling he wanted his head as close as possible to your head. He always wanted his tummy rubbed when snuggling.